Email overload is a pain for many reasons, but above all, the worst thing about an overstuffed inbox is the fact that you sometimes miss messages you shouldn’t have, or you forget to keep in touch with the people who are important to you. If you’ve run into these issues before, a new Y Combinator-funded startup called Etacts might be exactly what you’re looking for. Etacts is similar in some ways to CRMs like Highrise and SalesForce, but founders Evan Beard and Howie Liu say they’re focusing on helping people stay in touch, rather than on teams looking to complete sales. The service’s home screen features a list of people you know, ranked by how often you communicate with them via Email or phone. The list includes information like the total number of times you’re interacted with each person and when you first began talking with them online. Most important, it lets you know how long it’s been since you last contacted them, and lets you set regular reminders — if you go too long without talking to someone, the service will send you an alert. To start using Etacts, you enter your email account login credentials (at the moment the service only works with Gmail or Google Apps, but support for any IMAP service provider is coming soon). From there, Etacts will examine your inbox to automatically build out your list of important contacts, so you don’t have to do any work. You can also optionally enter the credentials for your mobile carrier, which Etacts can use to track who you’ve talked to over the phone or have text messaged. The service can use this data to offer plenty of related features. 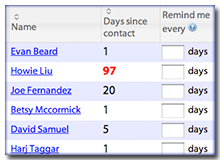 If you tell Etacts which of your contacts are especially important, it can automatically flag any new incoming messages. The service offers a plugin for Google Chrome and Firefox that adds a new button to Gmail’s interface: “Send and Remind Me”. Hit that, and you’ll send the message and automatically add a reminder to your Etacts account. If too many days go by without receiving a response, Etacts will remind you to resend your message (or to ask your contact what’s up). 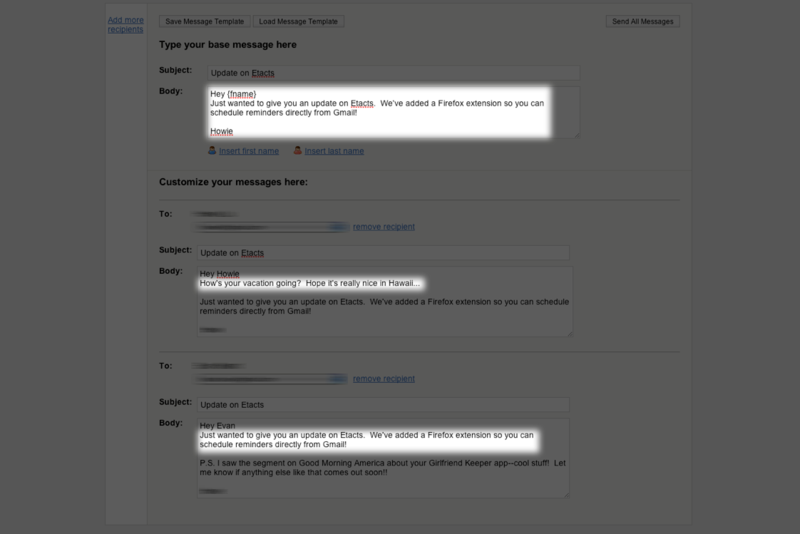 And, if you really want to pump out your correspondence, you can turn to Etact’s message sending feature. 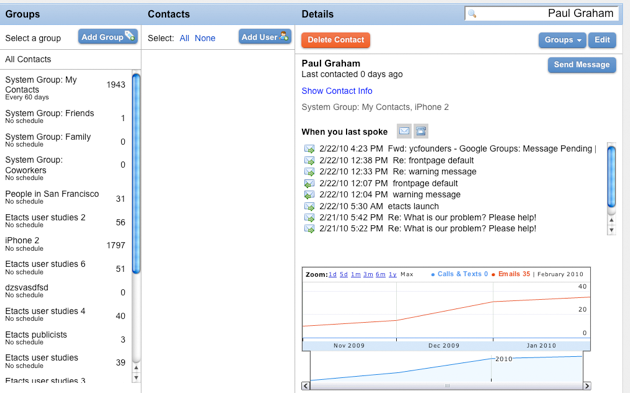 This allows you to build templates of messages you commonly send, with variables for each person’s name. It’s essentially a mail merge, but it makes it easy to manually tweak each message for each recipient — you can construct 90% of the message from a template, and then add a personal touch yourself. You can get a feel for how you can modify the base message from this screenshot. I really like most of the features Etacts has to offer — it’s straightforward enough that it didn’t take long at all to figure out how everything worked, and it seems like it would appeal to any professional that has to manage a sizable contact list. My biggest gripe with the service is the fact that it requires users to hand over their email login credentials to Etacts. The company only stores your Email headers (as opposed to the full message body), and I’m significantly more paranoid than your average consumer about this sort of thing, but other startups have had issues with this in the past. For example, reMail (which was just acquired by Google) launched with Email search that was powered by its own servers, and then switched to a model where searches were done locally on the user’s mobile phone (so that credentials weren’t exchanged).